Our podcast adventures continue this week, with our second week recording live from CBS Radio's studios. This time, the co-founder of Dragon Age and Mass Effect 2 studio BioWare will take your calls live. Greg Zeschuk will be our in-studio guest for the hour. On Wednesday at 11am Kotaku Time (that's 1pm ET, 10am PT), you will be able to call in and ask Zeschuk anything you want. And, knowing BioWare fans, you'll have plenty of questions for the man. Zeschuk follows the Kotaku Talk Radio guest-appearance trail-blazing of Amy Hennig, Ken Levine, Tim Schafer, Todd Howard, Cliff Bleszinski, Jeremiah Slaczka, Jeff Gerstmann, Major Nelson and Randy Pitchford. Nice way to start the new year. Look for a reminder post about the podcast at 11:00 AM mountain time (1:00 PM ET) on Wednesday. The post will include call-in info so you can ask your questions. The show will be live a few minutes after the hour. I'll expect to hear you calling our switchboard then. Regular listeners please note that our iTunes feed has changed. 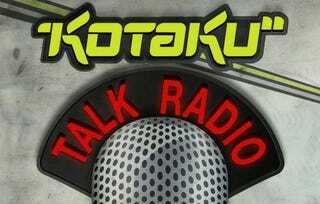 Subscribe to "Kotaku Talk Radio" in iTunes to continue to follow our show that way. We'll also continue to provide direct downloads of the show a couple of hours after showtime each Wednesday. UPDATE: You can also get us through Zune. And through RSS.